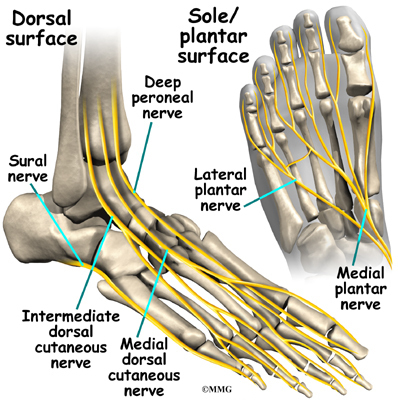 Nerves may be compressed from tight ligaments, inflamed tendons, tumors, fracture fragments, varicose veins, scar tissue or injuries to the foot that cause the foot and ankle to be misshapen (severe flatfoot). Nerve compression may cause significant discomfort with weightbearing. Night pain and pain while the patient is nonweightbearing are common as well. The most important thing a physician can do is to direct the treatment to the cause of the problem. If the foot is misshapen causing no pain (numbness, tingling or shooting), the nerve does not need surgery; the foot and ankle bones might. The wrong diagnosis can be disastrous. If a tumor or varicose vein is causing the pain it may need to be resected to allow the nerve to function normally. Anything abnormally applying pressure to the nerve may cause symptoms. If a tight ligament is identified, it has to be released to allow the nerve to function normally. Occasionally nerve conduction studies are performed to assess the degree of nerve compression and nerve damage. Nerve compression to the medial dorsal cutaneous nerve can occur at the outside of the ankle or as the nerve crosses onto the top of the foot. It can cause, numbness, burning, hypo or hypersensitivity to the nerve distribution which is localized to the top of the foot and between the second and third toes.